Buying a Viking refrigerator freezer is a major dream for many homeowners. Unfortunately, when shopping around Viking refrigerator prices are difficult to pin down. In this article, I hope to answer some of the questions the typical buyer has about the cost of Viking fridge freezers. Viking refrigerator reviews have a tendency to highlight the size of these appliances. This is hardly surprising as some of them are an exceptional 48 inches in width, the type of refrigerator size that is going to support a whole lot of capacity. Let us look at the prices for these units first. The high end of the Viking fridge range consists of the professional series. A great example of one of these models is the VISB548SS. This cabinet depth �Tru-Flush� refrigerator is loaded with features, but does not come cheap. You should expect to pay in the neighborhood of $8000 for one of these models. Fans or colorful appliances have a great option with this particular model, as it can be had in a variety of different finishes apart from the default stainless steel. These range from a pumpkin orange hue to a lemonade yellow; this wide range of color is great for fans of a retro look. There are many other 48-inch Viking professional models available with an assortment of minor features added. These include the VCSB548D-SS, and the� lineup. These range in price from $8000 to $11000. The slightly cheaper VISB548X and VCSB548X lack door mounted water and ice dispensers – an oddity for such an expensive cooling appliance – but are an alternative that allows you to purchase for roughly $1000 less. Quite a savings if you can live without that feature. As well as the Professional models discussed above, Viking also offers some designer options. The Viking Designer DFSB548D, DDSB548X and DDSB548DX lines sell for close to $9000, and they are clearly targeted at the very high-end consumer. Another option is the Designer FDSB548 panel ready model at $7800, but with additional charges for the custom panels. The VISB542DX (integrated) and VCSB542DX� (built-in) American style refrigerator freezers are great options for kitchens that have insufficient floor space for the massive 48″ models. At 42 inches in width, these units are priced between eight thousand and ten thousand dollars. They are similarly equipped to the wider models, and also include the custom colors option for those who really want to create a splashy effect in their homes kitchen. Note this option will set buyers back an extra thousand or two, but it is certainly a vibrant feature for those who value that type of thing. The Viking Designer collection in the 42 inch width range category include the DDSB542DB for just over $8500, the DDSB542X for $7500, and attractive wood finished DFSB542D is priced at eight thousand dollars. With these slightly smaller refrigerators, Viking gives up on the side-by-side layout and opts for the bottom mount freezer configuration. This is an understandable choice, as things can get tight when side-by-sides are made to narrow. 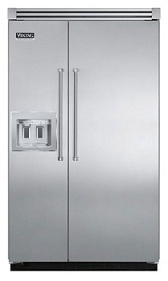 The top-end Viking refrigerator of this type is the Professional VIBB536LX/VIBB536RX range. These left hinge door/right hinge door swing models are priced at a little over $7000, but judicious shopping will enable you to find priced for a little less than that for the base models. Note again, is you want the attractive custom colors with brass accent option you will have to pay for it. At an extra $1500 it can push the cost of one of these units up to the eight thousand dollar price point. The VIB models discussed above are integrated refrigerators. Buyers preferring the built-in look also have access to the VCBB536LX/VCBB536RX range at a similar price point. For about $7200, the Designer DDBB536 bottom-freezer refrigerator collection is available at this refrigerator size point. Alternatively, the panel ready Viking Designer DFBB536X starts at $6500. With a price point of $4000, the 36″ Viking Professional VCFF136DSS appears to target wealthy consumers who want the Viking brand but are not willing to pay for their more expensive models. This particular counter-depth French Door refrigerator is somewhat similar to those produced by more mainstream brands in its feature set, but still offers the status of Viking for buyers who value it. Another option, similarly equipped but without water/ice dispensers in the door, is the VCFF136SS, which sells for a little over $3500. Also in this category falls the Viking Professional Side by Size fridge freezer, the VCSF136DSS. At $3700 the benefits of this model are debatable. It does not look that much different to a high end Maytag of Whirlpool model, so you pay a lot for the brand name with this particular unit. When you are looking for a freezerless refrigerator option, this manufacturer has several offerings. First is the built-in VCRB536LX/VCRB536RX selection. Prices for these models range from $6000 to $7000 dollars, depending on the finish chosen. Again, this refrigerator without freezer lineup is also available with an integrated design for a similar price – these are the VIRB536LX and VIRB536RX models. A cheaper option in this range is the Viking Professional DFRB536X. While not as feature packed as their more expensive brethren, at a price point of roughly $5000 it is a more affordable Viking freezerless refrigerator option. Viking does not even bother with combination fridge freezers at this size point. Clearly, they wish to maintain their reputation for spaciousness and not to try to cram too much into too small a footprint. In a familiar pattern, these are available in both integrated (VCRB530LX/VCRB530RX) and built-in (VIRB530LX) models. While still very expensive, Viking refrigerator pricing for these units is slightly more affordable, with the entry-level unit retailing at just over $6200 – but sometimes being available for less than $6000 with Viking sales or the occasionally available Viking rebate. At an even lower price, the Viking Professional DFRB530X – comparable to the DFRB536L/DFRB536R, but slightly smaller – also will set buyers back in the general vicinity of five thousand dollars. Clearly, Viking refrigerator pricing is relatively high, and thus they are not suitable for every buyer. However, if you value what the brand offers, and have the finances to afford them, they are a great option. Unlike Sub-Zero, Viking is a little less secretive about their pricing, but they do have strict control of sales. Products must be purchased through an authorized dealer, and dealers serve strictly defined sales areas – for example, you cannot buy from a seller in California is you live in New York. We do not sell Viking refrigerators direct here at www.fridgefreezersite.com. Similarly to Sub-Zero, however, is the brand premium in the prices Viking charge. This manufacturer has been very successful as positioning themselves as a premium brand in the minds of consumers. When performing major kitchen renovations to take their home �up market� many homeowners consider Viking refrigerators their best choice for improving their home in a manner that also increases the properties resale value. One important thing to keep in mind is that when you purchase a premium refrigerator brand like Viking you really should invest the time and money into properly maintaining it. Have any repairs or maintenance performed by your dealer, rather than having an unaffiliated third party work on your Viking refrigerator. By doing so you will accomplish a couple of important items; firstly, you will avoid invalidating the warranty, and secondly, you will ensure that any work done is of good quality. Also, be sure to only use – or have the maintenance man use – genuine Viking refrigerator parts. It makes very little sense to go cheap on replacement parts such as water filters. When buying a premium brand refrigerator, you should be prepared to pay a little extra for authentic parts and quality maintenance work. If you enjoyed this article be sure to visit this page� on Viking appliances for more.